Posted December 9th, 2015 by David Firth & filed under 3D, Emerging Technologies, Entertainment. 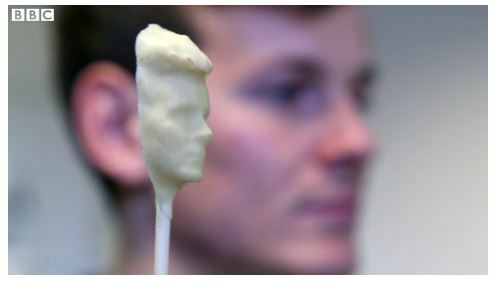 A start-up company based in London is offering to print out chocolate lollipops modelled on customer’s heads. 1) It is noted in the video that you can already print in chocolate, but this company prints a mold, and then uses a mold to make the chocolate lollipops. The reason, according to the company, is that this provides better quality. You can see from the photo above that the quality is really very good. What other things could you make and sell using this technology? 2) The price is about $2-$3 per lollipop, before shipping. Presumably this price covers all costs including salaries. Could you run a business like this?